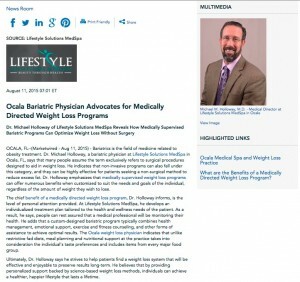 Dr. Michael Holloway of Lifestyle Solutions MedSpa reveals how medically supervised bariatric programs can optimize weight loss without surgery. Ocala, FL — Bariatrics is the field of medicine related to obesity treatment. Dr. Michael Holloway, a bariatric physician at Lifestyle Solutions MedSpa in Ocala, FL, says that many people assume the term exclusively refers to surgical procedures designed to aid in weight loss. He indicates that non-invasive programs can also fall under this category, and they can be highly effective for patients seeking a non-surgical method to reduce excess fat. Dr. Holloway emphasizes that medically supervised weight loss programs can offer numerous benefits when customized to suit the needs and goals of the individual, regardless of the amount of weight they wish to lose. The chief benefit of a medically directed weight loss program, Dr. Holloway informs, is the level of personal attention provided. At Lifestyle Solutions MedSpa, he develops an individualized treatment plan tailored to the health and wellness needs of the patient. As a result, he says, people can rest assured that a medical professional will be monitoring their health. He adds that a custom-designed bariatric program typically combines health management, emotional support, exercise and fitness counseling, and other forms of assistance to achieve optimal results. The Ocala weight loss physician indicates that unlike restrictive fad diets, meal planning and nutritional support at the practice takes into consideration the individual’s taste preferences and includes items from every major food group. Ultimately, Dr. Holloway says he strives to help patients find a weight loss system that will be effective and enjoyable to preserve results long-term. He believes that by providing personalized support backed by science-based weight loss methods, individuals can achieve a healthier, happier lifestyle that lasts a lifetime. Co-founded by Dr. Michael Holloway and his wife Shannon Holloway, Lifestyle Solutions MedSpa is a weight loss practice and medical spa located in Ocala, Florida. Comprised of an experienced team of bariatric physicians, lifestyle coaches, dieticians, and aestheticians, the practice emphasizes exceptional patient care and a superior experience. The practice offers customized, medically supervised weight loss programs as well as facial and body rejuvenation treatments, including CoolSculpting®, BOTOX® Cosmetic, Hydrafacial MD, and laser skin resurfacing. For more information about Lifestyle Solutions MedSpa, please visit lsmedspa.com and facebook.com/lsmedspa.